Budget Car Sales of Norwalk can save you thousands on a used car! The Budget Car Sales Advantage adds up to more than great savings on a top quality car, truck, van or suv. It also means an enjoyable car purchase experience and terrific customer service long after the sale. We hand select the finest cars we sell. We also work hard to find the best available lease returns, special purchase and trade-in cars. We are proud to offer you an amazing selection of the highest quality nearly new vehicles. Budget Car Sales is the New Car Alternative and your Los Angeles County Used Car Superstore! Come and see our amazing selection of the highest quality used cars, trucks, vans, and suv's. You will not be disappointed! Everyone from our management, sales consultants, and rental staff is dedicated to providing the highest customer service you have ever received. Leon Kaplan has the longest running uninterrupted show at Talk Radio KABC. It would be easy to dismiss this Sunday morning staple as just another one of those "car" shows, but one quick listen and you'll sense a master Motorman at work! Renting from Budget is a smart choice. Book your next rental reservation online today! 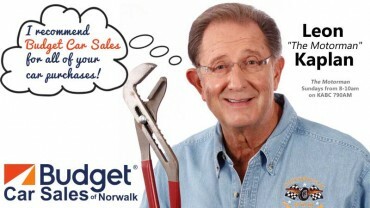 At Budget Car Sales Norwalk our financing and car prices are highly competitive. Just visit us to find out how you can save. Buying from us has never been easier. Schedule your test-drive and we will have the car of your choice waiting! Our super friendly sales consultants are here to help you. You needn't worry about high pressure sales tactics here. We have a huge selection late model used cars in excellent condition to meet your needs. Browse through the vast selection of competitively priced used cars that are awaiting your test-drive.